Sony’s IFA plans leaked online today thanks to an alleged copy of the company’s press invite for the Berlin-based tech show. The invitation, which was sent to Xperia Blog by an anonymous insider, features a collage of new devices including what looks like the rumored Xperia Z3 and an updated lens camera phone attachment. We’ve already seen a fair amount of the Xperia Z3, which is expected to offer a fresh look compared to Sony’s last few smartphones, which had a very similar industrial design. The upcoming Android handset should also come equipped with a Snapdragon 801 processor, 3GB of RAM and a 20.7-megapixel camera. Meanwhile, it looks like the company is preparing to update its lens-style camera lineup, which clips onto any iPhone or Android device to offer improved zoom and photo-quality. A few more products are visible on Sony’s leaked invitation, though it’s hard to tell exactly what we’re looking at. Maybe a new Bluetooth speaker or a desktop computer? We could throw out guesses all day, but it probably makes more sense to just wait for the actual event. 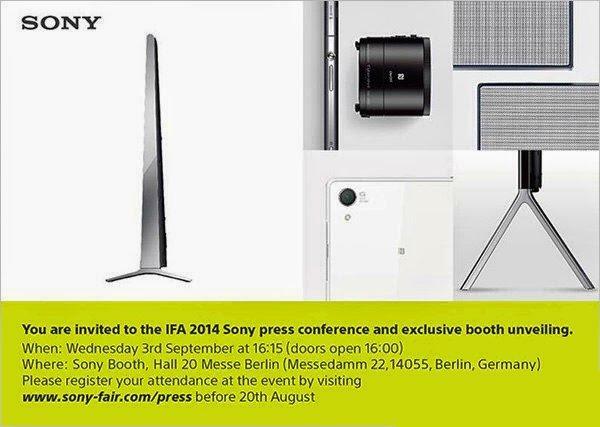 According to the invite, Sony’s big show will take place on September 3 at 4:15, and TechnoBuffalo be there live covering the news and everything else to come out of IFA 2014 in Berlin.